Size of this preview: 800 × 418 pixels. Other resolutions: 320 × 167 pixels | 640 × 334 pixels | 1,024 × 535 pixels | 1,280 × 669 pixels | 5,160 × 2,696 pixels. 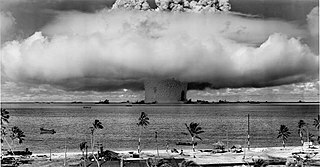 English: The "Baker" explosion, part of Operation Crossroads, a nuclear weapon test by the United States military at Bikini Atoll, Micronesia, on 25 July 1946 . The wider, exterior cloud is actually just a condensation cloud caused by the Wilson chamber effect, and was very brief. The actual mushroom cloud is inside the condensation cloud (compare with this image, a photo taken slightly later, after the condensation cloud had cleared). 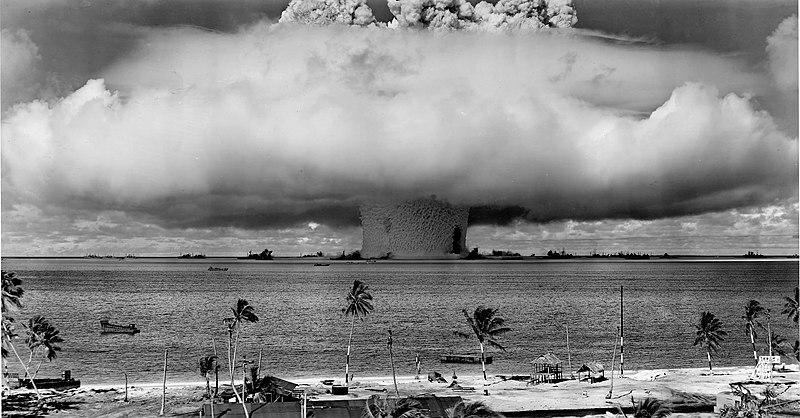 The water released by the explosion was highly radioactive and contaminated many of the ships that were set up near it. Some were otherwise undamaged and sent to Hunter's Point in San Francisco, California, United States for decontamination. Those which could not be decontaminated were sunk a number of miles off the coast of San Francisco. This page was last edited on 13 November 2018, at 20:29.